The What: At ISE 2019 in Amsterdam, Meyer Sound is previewing a redesign of its point source loudspeakers, the ULTRA-X40. The What Else: Drawing from the proven design approach of LEO Family loudspeakers, the ULTRA-X40 employs a concentric driver configuration with dual 8-inch neodymium magnet cone drivers coupled to a low-mid waveguide surrounding the single 3-inch diaphragm high-frequency compression driver. The 110 degrees by 50 degrees Constant-Q HF horn is easily field rotatable, and working in concert with the concentric design it ensures that the full bandwidth coverage pattern will be uniform with either horizontal or vertical orientation. The ULTRA-X40 also incorporates a newly designed three-channel class D amplifier that produces a total peak output power of 1950 W with very low power consumption thanks to its highly efficient design. The new amplifier design also contributes to a total system weight of only 55 pounds (25 kg), a reduction of more than 20 pounds relative to the UPA-1P. Preliminary performance specifications include an operating frequency range of 60Hz to 18kHz, with linear peak SPL of 130.5dB measured with M-Noise, free-field at 4m and referred to 1m. Highly refined signal processing with advanced phase alignment methods results in phase response of ± 45 degrees from 100Hz to 16kHz. Another variant in the ULTRA-X40 family, the ULTRA-X42, offers the same performance but with the coverage pattern defined by a narrower 60 degrees by 50 degrees Constant-Q HF horn. The rear-panel features a female XLR three-pin input connector with a male loop output. The optional RMS remote system monitoring module provides comprehensive monitoring of loudspeaker parameters from a host computer running Compass software. In addition, the optional XLR 5-pin connectors version of the input board accommodates both balanced audio and RMS signals. AC line power is furnished via loop-through powerCON 20 connectors. 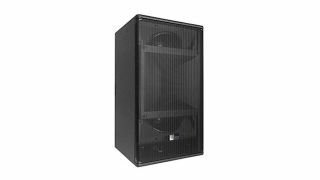 Housed in a premium multi-ply birch enclosure with textured finish, ULTRA-X40 loudspeakers measure 12.51 inches (318mm) wide, 22.31 inches (567mm) high, and 14 inches (356mm) deep. An integral handle for portable applications is standard, but it may be quickly removed for permanent installation. Flexible mounting and rigging is facilitated by 11 integral M8 points as well as an integral 35mm pole mount receptacle with an M20 threaded insert socket for added stability. The Bottom Line: The new loudspeaker series features a concentric driver configuration, new amplifier and processor technologies drawn from the LEO Family of line array loudspeakers, a rotatable horn, a high power-to-size/weight ratio, and a wide selection of versatile rigging options.